It's been a busy month for me, Easter holidays and fun family things at the start of the month and then the garden which, after a long winter was looking woeful and neglected. It's now looking less so - veggie patch cultivated and seeds growing, flower beds ongoing and will be for some while. And so my reading has suffered a bit but that's the way it goes sometimes and it can't be helped, some months are full of reading, others not so much. 23. 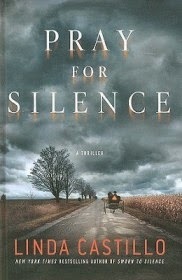 Pray for Silence - Linda Castillo. This is book two of the author's Kate Burkholder series set in Amish country in Ohio. This is the Goodreads blurb: The Planks moved from Lancaster County, Pennsylvania to the small Amish community of Painters Mill, hoping to resume the comforts of the Plain Life in Ohio. Less than one year later, the family of seven is found dead--slaughtered on their own farm. Police Chief Kate Burkholder and her small force have few clues, no motive, and no suspect. Formerly Amish herself, Kate is no stranger to the secrets the Amish keep from their "English" neighbors--and each other. When the diary belonging to the rebellious teenager Mary Plank turns up, Kate is surprised to find not only a kindred spirit but a murder suspect: the charismatic stranger who stole Mary's heart.Then there's Mary's brother, Aaron. Shunned by his family and the rest of the Amish community, could he have returned to seek revenge? Now it's up to Kate to search for some dark truths about the Planks--and confront long-buried secrets of her own. As Kate's obsession with the case grows so does her resolve to bring the killer to justice--even if it means putting herself into the line of fire . . . I think this one was even more gruesome than the first book in the series. I loved it! Again, as with the first book, it was a real pageturner as more and more secrets were revealed. The Ohio setting is very well portrayed... I have been to Ohio so it was a bit of a nostalgic read for me. I like Kate Burkholder very much, she's not perfect and she's had awful problems in her past but is hanging in there and doing the best job she can. I thought I had the solution all worked out but of course I didn't at all. An excellent crime read but not suitable if you're not keen on gruesome descriptions. This month I seem to have concentrated quite a lot on Carl's Once Upon a Time IX challenge. 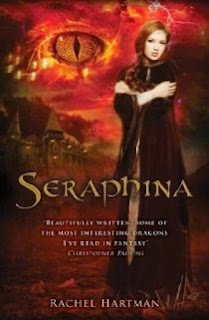 Three of the books were for that and all three were enjoyable, particularly Seraphina by Rachel Hartman. I also enjoyed Linda Castillo's second Kate Burkholder book, Pray for Silence, and am pleased to have more of those to read next month. Agatha Christie's autobiography. More about it within the next few days but I thought it was utterly delightful. Probably the best autobiography I've ever read. No idea what I'll be reading next month. I have eight library books and a TBR pile of hundreds, so I'm hoping I'll find something I like. Happy reading in May! 1. 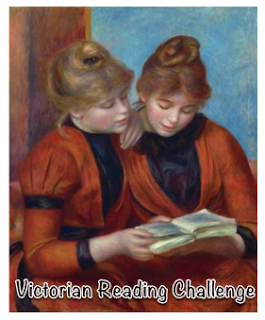 Bev's 2015 Mount TBR challenge. I signed up to the Mont Blanc level which is to read 24 books throughout the year. So far I've read 10 with the 11th. book well on the way to being finished, so that one is going well. 2. The Victorian Bingo challenge. This is a bingo card style of challenge and for it I need to read at least 5 books. So far I've only read one. That's not very good going but I have plenty of time to catch up and plenty of books to choose from. Some are suited to Carl's R.I.P. autumn challenge as well so I'll double up when I do that. 3. 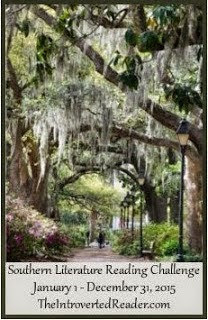 The Southern Literature reading challenge. For this I signed up for 'Pull up a seat and stay a while!'. 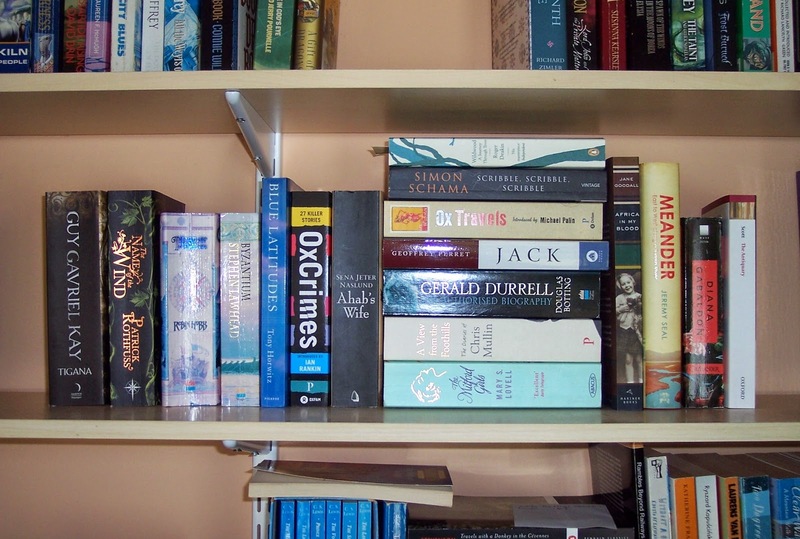 Which is to read 3 or 4 books in the course of this year. So far I've read one, which is ok... not wonderful... but I have no fears that I won't finish this one. 4. Carl's Once Upon a Time IX. I'm doing Quest the First which is to read 5 or more books between the 21st. March and the 21st. June. My total so far is 4 so that one is going swimmingly. I would expect to read at least 2 or 3 more for that challenge. It might not look all that different but in fact there are 6 books missing from it. I've read 5 and the 6th. - the Agatha Christie autobiography - is coming along nicely. So, in actual fact, almost a quarter of the books have been read and I'm really quite pleased with that. So, some challenges going really well, others not so well, but luckily I have plenty of time to catch up. 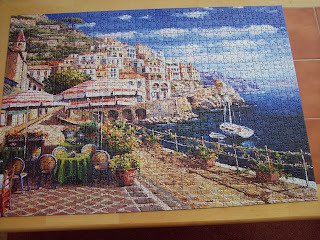 And really the plan this year was to take it a bit easier with challenges and that's what I've done. It's much more casual and a lot more fun, I find, to do just a few that interest me. 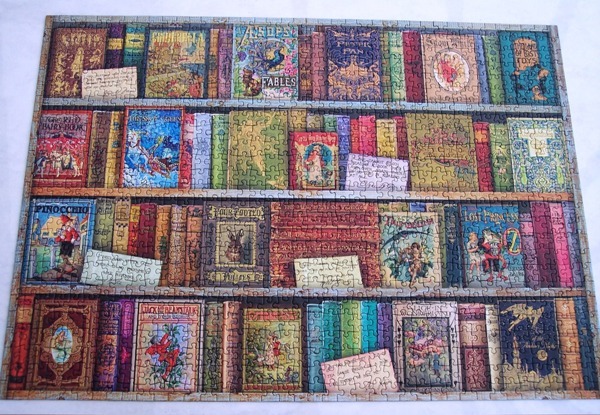 Happy reading or jigsaw puzzling, if you're an enthusiast like me. I seem to be doing quite well with Carl's Once Upon a Time IX challenge so far. I didn't think I was in the mood for fantasy but perhaps I was wrong as Seraphina by Rachel Hartman is my book 4 for it and the challenge still has quite a long way to go. Seraphina is a court musician and an important one as she is deputy to the court composer, Viridius, and handles much of the teaching of the younger musicians. Music is in her blood but to a certain extent she has to hide some of her vast talent because she has a huge secret. Her father of course knows that secret and is insistent that she keep a low profile. Easier said than done when Seraphina is in charge of Princess Glisselda's music lessons. The princess is the Queen's grand-daughter, the queen who made peace with the dragons some forty years ago after a long war. The peace is popular with some and not with others. Dragons have learned how to take human form and are now teachers in the university, one of them, Orma, is a mentor to Seraphina and he too knows her secret. The peace is fragile and becomes even more so when a royal prince, Rufus, is murdered. His head has been bitten off and suspicion falls upon dragonkind as this is one of their methods of killing. Seraphina does not believe they are responsible and because Princess Glisselda always listens to her, finds herself investigating the murder along with Glisselda's fiance, Prince Lucian Kiggs, Captain of the Queen's Guards. It's a poisoned chalice sort of a task. She must at all costs keep her secret, but Lucian is an intuitive sort of person and soon realises that Seraphina is not what she seems. Lies have become a way of life for Seraphina. How she will find a murderer and still keep her secret will be one of the most difficult tasks of her young life. You know how some books start slow and you get to about page 50 and you still don't know what all the fuss is about with regard to certain books? And then you get to around page 100 and you think, 'Ah... now I get it.' Well that's how this book was for me. I'm not even sure what kept me reading to be honest. Dragons perhaps? Seraphina herself? A hint of romance? The mystery of who killed the prince? All those things perhaps. Whatever it was I'm glad I did as I ended up enjoying it so much I gave it 5 stars on Goodreads. Seraphina herself is a fascinating protaganist. Conflicted, full of guilt for something that wasn't her fault, dangerously ambivilent in nature, life is hard for this poor girl. I liked her determination to make a good life for herself, despite these drawbacks, and spent the entire book cheering her on. She alone makes this book worth reading. It's quite a complicated world that Rachel Hartman has created here. Dragons and humans have one of the most uneasy truces you can imagine and as with all situations like this there is no black and white. The Humans are good and bad and so are the dragons. The conflict this creates makes for a good novel and although I'm not really a 'court intrigue' sort of a person I still enjoyed this aspect of the book. I'm also a bit of a sucker for any hint of romance and this was another instance where you had to feel very sorry for Seraphina. Hopefully that will resolve itself in future books but I actually don't mind a bit of drawn-out angsty romance. All in all I think it was the mix of all kinds of threads and situations which eventually sucked me, hook line and sinker, into this book. I ended up loving it and am now after book 2, Shadow Scale, which came out last month. At last, a book review from me. I'm having rather a slow reading month... almost three weeks into April and I've only read three books. There are reasons - Easter, family stuff, the garden is getting underway now and things need tidying after the winter... seeds planting and so forth. 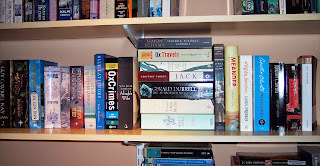 All good fun and let's face it, my books are not going anywhere, they'll be here when I'm more free. Anyway, the book I've just finished is Un Lun Dun by China Miéville. Twelve year olds Zanna and Deeba are best friends at school and at home. Deeba starts to notice that odd things are happening around Zanna, animals staring at her as though they recognise her for instance. One of their friends is nearly killed in a car accident caused by a very strange foglike substance. Then one night they look through the window, down into the street, and see a broken umbrella acting as though it's watching them - it then stumbles off. They go out into the night and follow it and end up in an underground tunnel turning a wheel that takes them to a place that seems wrong in every respect. 'Unlondon' is an alternative London where rubbish or abandoned things end up. The buildings are made of defunct items such as typewriters or old washing machines, one has a forest inside. The people aren't quite right either. One man is made of printed paper with a pincushion for a head, another wears a diving suit that hides his appearance. There's a stange individual called Brokenbroll who has control of all the broken umbrellas that 'come over' from London. And there are ghosts and a half-ghost boy, Hemi, who befriends them. The two girls are told that Zanna is the chosen one, the 'Shwazzy' (from the French: choisi). Unlondon is being besieged by an evil Smog and it's been prophesised that a blonde-haired girl will come from London to save them. Zanna is the one. But is she? After a run-in with the Smog the girls return to their own London with Zanna's memory lost. And thus it's Deeba who worries about how things are in Unlondon and Deeba who finds a way to return. She's not the chosen one but must nevertheless find a way to defeat the Smog, not just for Unlondon's sake but for her own London's sake as well. Ok, so this wasn't quite what I was expecting. I think I thought it was aimed at young adults of, say, 14 to 16 but I think it's more aimed at the 10 to 14 age group instead. Not that it matters as people of any age could read and enjoy it but it's nice to be aware. China Miéville's adult books are unusual I gather (I haven't read any) and possibly a bit challenging. 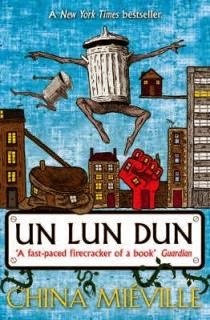 Un Lun Dun is definitely 'unusual' but is not at all challenging to read... not for adults anyway. I think 10 year old children might find it so but also find it worth the effort as it's full of imagination with some very different, sometimes creepy, characters. All kinds of wierd things going on with every-day objects like umbrellas used as weapons, buses flying around the sky, a forest growing in a house, Westminster Abbey the centre of a spider's web that's full of portal type windows. Yes... it's that weird. But it works and is great fun. Where it came up a bit short was in the characterisation. I never really felt much of a connection to Deeba. I admired her bravery and dogged determination to defeat the Smog but she didn't always feel like a real twelve year old girl. I think we may be back to my age-old complaint that most male authors just don't write girls or women very well. What I do admire is that the author did it at all. The fantasy genre is choc-a-bloc with books with young male protagonists so all power to China Miéville's elbow for being prepared to give us a strong 'girl'. It makes a refreshing change. I'll be putting this one aside for my grandson to read in a year or two as I think he'll like its oddness and imagination. Although at the moment he's showing signs of being more of a non-fiction fan where books are concerned... with a definite liking for books full of facts about the natural world. To be honest, I'm just happy that I have two grandchildren who like to read. Un Lun Dun is my book 3 for Carl's Once Upon A Time IX and my book 10 for Bev's Mount TBR 2015 challenge. We're now a quarter of the way into 2015 so it's time for checkpoint #1 for Bev's Mount TBR challenge. Bev asks participants to answer some questions. My aim is to climb Mon Blanc and that involves reading 24 of my own books this year. So far I've read 9 which means I'm three quarters of the way to the top of Pike's Peak (12 books). I'm also ahead of where I should be which is a nice cushion to have. It could be that I end up climbing higher than Mont Blanc but I've no intention of actually pushing myself to do it, if that's the way it ends up - fine. If not, no problem. The cover of Helliconia Winter by Brian W. Aldiss shows a scene from the book with a 'Phagor' in the foreground watching some ships carrying humans who are on the run from the authorities and looking for somewhere to land and resupply the ships. I love the wintery, snowy mountain scenery and the depiction of the strange unknown statue. The cover art is by Tim Gill. 2B: My favourite character so far has been Mrs. Ross from The Tenderness of Wolves. Her life is far from perfect already with a husband who is uncommunicative and surly and a son who is alienated from her. Then the son is suspected of murder and disappears off into the Canadian wilderness of Ontario. 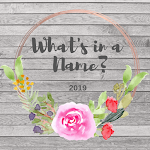 Despite the fact that Mrs. Ross is terrified of wilderness, off she goes in search of him with a complete stranger, enduring incredible hardship. You have a to admire a woman like that, brave, indomitable and devoted to her son. They were a tough lot back then. 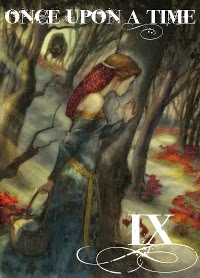 My second book for Carl's Once Upon A Time IX is Blackbringer, book 1 of the Dreamdark series by Laini Taylor. Magpie Windwitch is the grand-daughter of the West Wind and a female Faerie. This makes her different to other faeries. Along with her parents she is able to hunt down and dispose of escaped devils or 'snags' as she calls them. More devils are escaping these days as humans keep freeing them from their prison containers... bottles, flasks etc. She's kept very busy travelling the world, doing her work, with her clan of crow companions. The discovery of an abandoned fishing vessel causes unease in Magpie. She senses an unusual devil is behind the disappearance of the fishermen. She returns to the place of her birth, Dreamdark, in Scotland, a huge area of land that includes forests and mountains which is cut off from the outside world by an impenetrable hedge. Here she finds long lost friends, new friends and a new queen that she makes an instant enemy of. But she's not here to see them, she's here to find the Magruwen, the leader of the seven Djinns who made the world and may have originally imprisoned the marauding devil she now seeks. He may have information that can help her. The Magruwen's been lost for many thousands of years but even if she does find him Magpie is certain he won't want to help capture a devil who's a danger to the whole world. Regardless of that, Magpie knows she must succeed in her deadly mission or risk losing everything. I'll be honest, I'm not a huge fairy story fan. When I picked this Young Adult book at random from the library shelves I was initially attracted by the gorgeous cover (it's by Jim Di Bartolo). I wasn't really expecting the blurb on the back to sound interesting enough to make me want to take it home. But, against all expectations, it did. And I'm really glad about that. Blackbringer turned out to be one of those pleasant little surprises you get from time to time when a book surpasses your expectations. I would call this book charming. And yet the faeries in it are not actually charming in themselves. They're gritty little characters, fiesty and determined, ready to kill if need be. Just like us they're petty, resentful, bullying, violent... but also resourceful, brave and kind. The author has created an interesting world with all the key ingredients you would expect from a fairy tale... magic, spells, potions, strange little imps, devils, djinns, talking crows. All this you would expect and might think the book would be a bit run-of-the-mill and predictable. To be honest I'm not sure why it wasn't and what it was about the book I liked so much. I'm normally impatient with books that have what I consider to be slightly dodgy Americanised British (in this case 'Scottish') accents. But not even that put me off. I think it was simply that it was different enough and charming enough for me to enjoy it. Plus, I really liked Magpie Windwitch who wasn't a pretty little faerie, but a tom-boy girl who enjoyed an exciting life and didn't fuss over her appearance. She was refreshingly different and I liked the fact that the author did this with a female character as it's usually the boys who get all the exciting roles in books. Nice job. There's only one sad thing about this and that is that there are only two books. Blackbringer was Laini Taylor's first book. She wrote one more in the series, Silksinger, and then went on to write another series called The Daughter of Smoke and Bone. 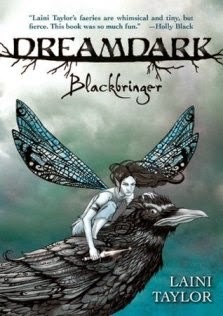 So I assume no more Dreamdark books. What a shame, as it really is an enchanting world she created.